← Smile-Gang #522 – 11th Anniversary – Tria”sma”lon START! ^Image taken from Ueda Kana’s twitter. Let me say emphasize one thing. This is what I label to be a COMPILATION report. Meaning this is something I put together by reading blogs of those who attended the Nanoha stage at Anime Contents Expo (with my thoughts and weird imagination added in). I was not there personally as Japan is too far away. Please see source blogs at the end of this post. Anyway… onto the stage event. It started with the showing of a 3 and a half minute brand new PV for the movie, followed by Mishima Akio’s entry. As with pretty much all Lyrical Nanoha events, King Records’s Producer — Mishima Akio (hereby nicknamed Mishi-P) is the MC. Mishi-P has told everyone not to write/reveal too much about the PV, so that might explain why there’s not much information on it. Mishi-P: In most comedy shows, there is something called a 3 part joke. Now, Kana-chan, how did you feel after the recording? As you might know or have guessed already, such a thick script means long movie. 2 hours and 30 minutes. Mishi-P reminds everyone to use the washroom before they enter the cinema. After that question, Mishi-P asked each of them their thoughts on the A’s movie this time. Mishi-P also points out that she’s saying something she doesn’t mean. Heh. Yukarin: No, it’s true! I can’t express it properly… But I’m sure Nana-chan can. Nana: Don’t raise the bar on me! But everyone gave off the same fresh atmosphere as 7 years ago. Nana: You’re all supposed to agree! Agree! Kana: The recording studio was crowded. Now there’s only 3 of them on stage (Yukari, Nana, Kana), so as Nana said on her blog, they’d immediately know who pressed/did not press the button. There is no way for me to determine whether the following consists of ALL the questions that were asked, but these were what I was able to collect from various blogs. Question: I’m glad the producer was Mishma. Mishi-P: Fine, let’s change the question. It would’ve been better of the producer was NOT Mishima! Mishi-P bullying aside, they move on to something slightly more related. Question: You have something you want to say (complain) to the staff. Who is it? Obviously it’s… Yukarin! Yukarin: Because! I (Nanoha) didn’t get much screen time despite being the main character! There was too much wait time in between. I got less lines than Masumin (Linith’s voice actor) in the 1st movie! ^Hahaha. Nice one there, Kana! By wait time, she means the time when Nanoha does not appear in a scene. Yukarin then said that because the wait time in between was long, her only source of enjoyment was the snacks. Question: Compared to 7 years ago, there are characters who became different due to the voice actor. Nana: …It was me who pressed it. I didn’t remember the WolkenReitter to be so noisy back then. The specific “noisy” characters were Vita and Zafira. Everyone agreed that Zafira (Ichijou Kazuya) deserves special attention. Even during the recording, as he screamed and yelled (during the battle scenes) in the recording booth, everyone else outside couldn’t hold in their laughter. Question: If there’s a 3rd movie, I’d want to be part of it! Yukarin: The total came out before I got a chance to press it! (Bonus) Final Question: It all depends on the salary. Right before the stage event came to an end, Mishi-P made some announcements. ^About the third point… The fact that it was MENTIONED indicates to me that it’s highly possible. I think what’s “unknown” is whether they would get her to sing a new song or make an arranged version of Snow Rain. Finally, it is time to part. Mishi-P asks the 3 of them how they’re feeling. Yukarin: It… was fun… *deadpan* …*laughs*… No, it was honestly fun… Your turn, Nana-chan! That seems to have been pretty much it. The general consensus seems to be that this 30 minute only stage was waaay too short. And I guess it would be, considering it’s those 3 (plus Mishi-P) on stage. Next to look forward to would be the stage greetings when the movie starts… Unless there’s some other event in between. Anyway, Kana-san!!! Speaking about Kansai ben, I find that accent very very hard to understand. without subtitles, I’d never be able to understand Hayate’s speech perfectly…>> How about you? D’you have troubles translating/understanding accents like that? And lol at Kana, the recording room was crowded…I can imagine them shoving each other playfully while waiting for their turn to speak hahaha. If StrikerS is going to be made into a movie, they’d probably have to split the movie into two or something Dx too many characters and stuff to cover in just 2 and a half hours. The Mishima bullying was genius! April fools or not, I can bet Nana had some fun taking a part in that xD usually she’s the one being bullied fufufufu. One of the best things about the Nanoha events is of course, Yukarin’s on-stage-awesomeness. And this event didn’t disappoint. 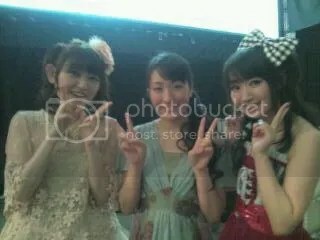 lol YUKARIN SAIKOU. I laughed so hard when she said she didn’t get to press the button LOLOL OMG. And when salary talk came I nearly ran out of breath. Money-loving Yukarin ftw!! Other than her, who is the other one who pressed the button? Kana? 30 minutes is truly waaaay to short when it’s four people talking…and two of them likes to go off topic too 😛 I don’t think there will be any other event after this though, I mean, July is only 3 months away…so it’ll probably the Movie Stage Greeting after this…(and I’ll wait for a report for that event from you too Kasukasu-san xD Sorry for the trouble!). Oh yea, Natsuko Kuwatani did two roles and Chiwa Saito did what, three or two? I think other than splitting the movie into two parts, they would have to write out several characters as well. Like they did with the Lieze twins for A’s movie >>. Man I can’t wait for the stage greeting. What awesomeness would Yukarin do this time? Muahahaha. Okay virtual hug it is! (ノ゜ω゜)ノ Thanks very much once again~! Well I think it got the info we need to know about the upcoming movie. I would say. Job well done, Kasumi. Thanks for the info! Quite a shame that is only 30min. I can imagine that the 3 big female seiyuu got also other important agenda things to do. I found the quiz interesting. I lol’ed hard at the first question. About the movie 2nd, I am very much worried. 13eps of already stated greatness is going to be cramped into a 90minutes movie – hopefully for a fully 120minutes, I doubt it – it is not going to end well. I am not biased that movie retelling is bad. It is just because I truly enjoyed Nanoha A’s. Yes, all 3 of them had other stage events to attend. Woah, sorry, I completely forgot to get back to you about the Seven Pieces. Yes, I did watch the one you linked me to (which was episode 3). I’m not going to make a separate post on that because there is nothing (aside from the video footages) that we don’t already know from other interviews. In fact, putting it another way, a large part of this interview felt like a detailed recount of Shin Ai. Good to hear that the movie will be longer. Can’t wait for it. Potatoooooooo-san lol. Just a small head’s up, Nanoha.com has a new trailer out (the one they showed during ACE xDD) and a full report of the Seiyuu event….